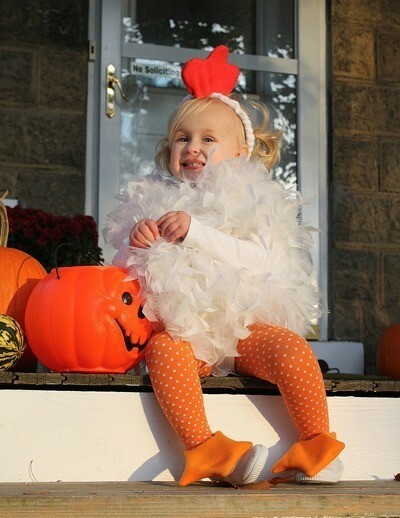 The chicken costume is one that will always be popular with both adults and children. 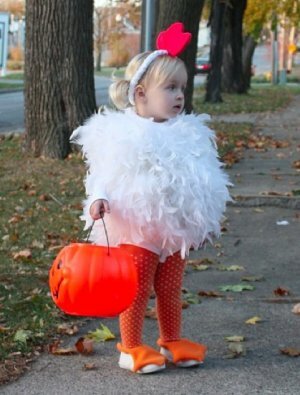 There are lots of chicken suits for sale at costume shops, but a homemade chicken costume can be even better. 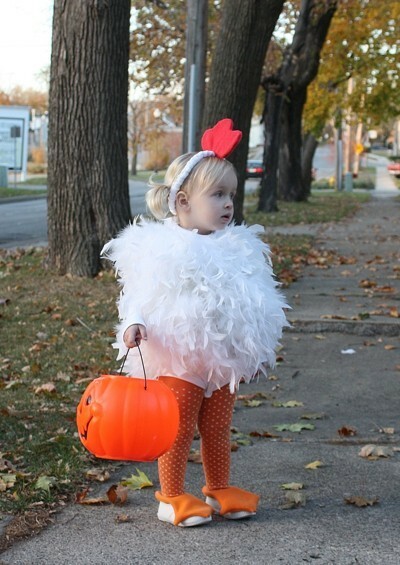 This is a guide about making a chicken costume. 1 onesie. I bought a long sleeve turtle neck onesie from Target for $4. 2 fluffy white boas. I bought one at the flea market for $2 and got the other on eBay for $5. 1 pair of orange tights. I bought mine from Gymboree on sale for $4. An 1/8th of a yard of white fleece, 1/8th of a yard of red fleece, 1/4th of a yard of orange fleece. Enough elastic to fit your child's head. 2 pieces of Velcro for the feet. Stitch one white boa to the front of the onesie and one to the back. I did a double stitch every inch or so. Try and pull the feathers back so you can get the thread around the rope of the boa. It's much easier to stitch from the inside of the onesie through to the front of the onesie. Grab a pair of your child's shoes (sneakers are what I used). Use a piece of paper (this paper will be used as a pattern for the foot) to draw the shape of a duck/chicken foot that will extend longer and wider than the top of the shoe. Once you have that shape traced, you'll want to add to the pattern, from the back of the foot on each side, about a 2-3 inch long by 1/4 inch wide strip. This will be how you will secure the foot around the ankle and keep it over the shoe. You'll want to cut out 4 in total, 2 for the top, 2 for the bottom. I used Velcro to secure the 2 strips of extended fabric around the ankle. I sewed the feet, but I am sure if you only cut out of fleece one foot, you could leave it unfinished and not sew it. For the head band, I measured what the length of elastic I would need. I cut, out of white fleece, double the length of the elastic and double the width. I folded the white fleece in half and sewed the open end down its length. I turned it right side out when I finished (so the seam was in the inside), used a safety pin clipped to the end of my elastic and pushed it through the headband. The white fleece will be much longer so it will scrunch up when the elastic is through the head band completely. I hand stitched the elastic closed, when both sides were through each side of the white fleece head band. I then hand stitched the head band closed. For the red 'comb' on top, I traced out what I thought it would look like, about 3 inches long by 2 1/5 tall. I cut 2 combs out of the red fleece. I sews the top of the comb closed with a sewing machine, leaving the bottom open. I then traced out of card stock a smaller version of the comb and inserted it into the red fleece to give it more stability and allow it to stand up. I then hand sewed the bottom closed and hand sewed the comb to the top of the head band. This costume was got so much attention. I was so glad I went through the effort in making a handmade costume. Most of what I do is just trial and error so don't be afraid to try. Source: Inspired by the Martha Stewart Chicken costume. The feet and the head band are original. This is so adorable. The feet and the headband are my favorite parts! Great job! How very precious and what a great job!